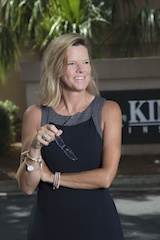 Missy Layman was born and raised in the Lowcountry, and has lived in Hilton Head and Bluffton since 1972. She attended the College of Charleston. In addition to earning her degree, she played basketball for four years. Off the court, he was inducted into the Political Science Honor Society, Omega Delta Kappa Honors and Leadership Fraternity. and was a member of Tri Delta sorority. After graduation, she entered into insurance with Kinghorn Insurance Agency and has done that since 1987. She specializes in employee benefits and life insurance, Medicare, and executive planning. She is double-licensed in Property/Casualty, and Life and Health. Missy loves what she does. For over 31 years she has had the privilege of serving and building relationships with amazing people and businesses that make our beautiful community successful. Outside of the office she loves spending time with her family, playing tennis, the beach and travel. Contact Missy Layman today at 843.686.3911 or email: mlayman@kinghornagency.com.